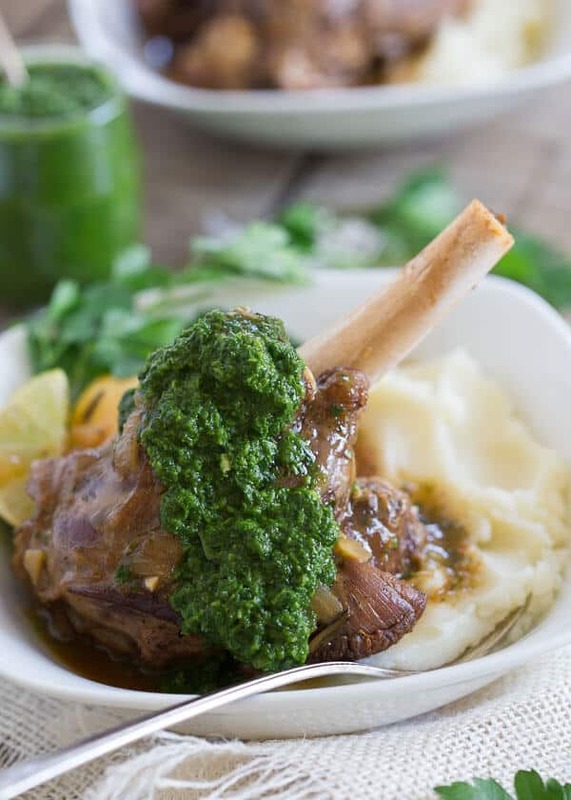 These citrus braised lamb shanks are served with a spicy green harissa. They’re cooked until falling off the bone tender and served with the sweet and tangy citrus juices. Shank. A word that either conjures up visions of striped uniforms and shady bathroom stall killings or, a deliciously impressive, cook all day kind of meal. We’re going with the latter today. I saw a lamb shank on the cover of some random food magazine while in Barnes and Noble a few weeks back (because my husband acts like it’s 2001 and we still have to actually GO to bookstores to buy books. Granted this is the same man that said to me two days ago, “I just don’t GET what a hashtag is” so it’s not too surprising really) and that hunk of meat has stayed in my brain ever since. Here’s the thing, I never cooked a lamb shank before this meal (although I’ve since changed that and this apple cider braised lamb shanks has become one of my absolute favorite weekend meals!). So when I got to the grocery store and saw them looking nothing like they do in this picture, I for sure thought it wasn’t the right cut. I came *this close* to asking the butcher why the bone wasn’t sticking out so pretty like a perfect little caveman handle and if he could “fix” that for me but ended up chickening out and walking away. So, I went home and watched YouTube videos instead. Convinced I had to “French” these shanks, I googled “how to french trim a lamb shank” and watched some weirdo long haired teenager hacking away at the bone for about 3 minutes. Not convinced that was the way to do it, I played around with different phrase combinations for about an hour before finally figuring out you really don’t have to do anything to the damn shank. Apparently, the meat kind of recedes up the bone as it cooks and creates the dramatic lollipop effect every cooked shank has. Well, who the hell knew? Without any fuss, after 3 hours or so of cooking, these citrus braised lamb shanks look like this, no bone hacking required. Since it’s still cold as heck and dark by 5 in these parts, there’s really nothing I enjoy doing more these days than cooking something comforting and hearty for hours during the day. Between the smell that fills up the whole house, the heat from the oven and the warm meal when it’s all finished, it’s just perfectly fitting for this time of year. Although super comforting, this lamb is about as bright tasting as winter meals can get. There’s citrus zest, juice and even Nakano citrus seasoned rice vinegar in this which makes it sweet and tangy all at the same time. No heavy sauces here, this is actually a really fresh and healthy meal. The green harissa is definitely optional but there’s something about the combination of citrus from the lamb and the vibrant cilantro and spice flavor that come through in the harissa that just mesh perfectly in this dish. It’s like winter meets the verrrrry beginnings of spring and I’ll gladly eat up for that! Love this Citrus Braised Lamb Shank Recipe? Then try other recipes like Apple Cider Braised Lamb Shanks, Peach Honey Grilled Lamb Chops, Moroccan Lamb Lentil Stew, and Grilled Halloumi Lamb Burger. 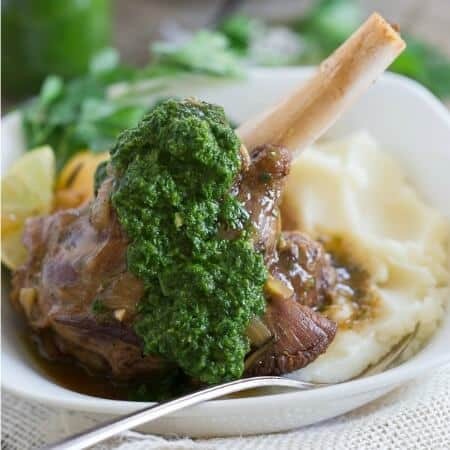 These citrus braised lamb shanks are served with a spicy green harissa. They're cooked until falling off the bone tender and served with the sweet and tangy citrus juices. In a large heavy bottomed oven safe pot or dutch oven, heat 1 tablespoon of the olive oil over medium-high heat. Season lamb shanks generously with salt and pepper and place them in the pot once hot. Brown on all sides then transfer to a plate. Add the remaining tablespoon of olive oil to the pot with the carrots, celery, onion and shallots. Cook for about 7 minutes until softened. Add the garlic, rosemary, thyme, tomato paste, zest and juices to the pot and stir to combine. Cook for about 1 minute until fragrant. Add the Nakano citrus seasoned rice vinegar and scrape any bits from the bottom of the pan. Cook down for an additional minute. Add the broth to the pot and place the lamb shanks and any of their accumulated juices back in the pot. Bring to a simmer, cover and transfer to the oven. Cook covered for 1 1/2 hours turning the lamb shanks once. Uncover and cook an additional hour. 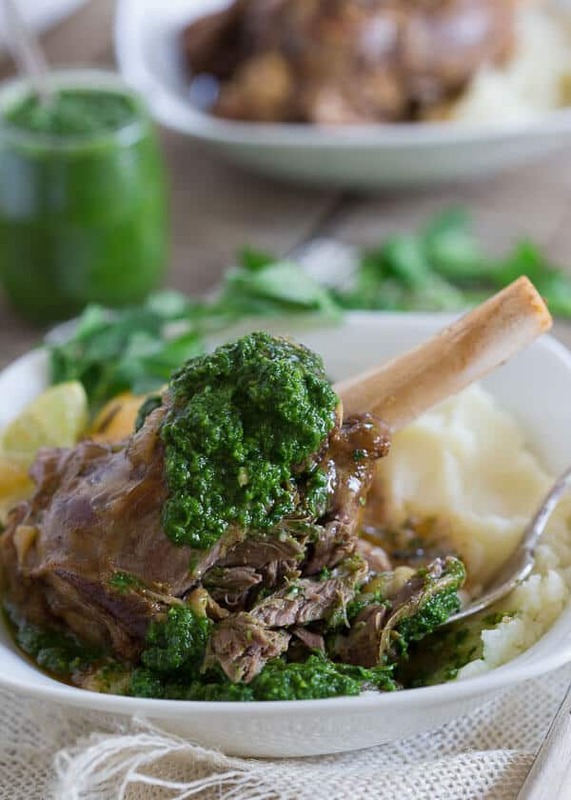 Serve the lamb over mashed potatoes with the sauce from the pot and the green harissa. With the processor running, drizzle the olive oil in slowly. Scrape down sides as needed and process until a pesto-like consistency. These are beyond gorgeous! I am such a huge fan of lamb in any form, but particularly lamb shanks. My mouth is watering as I look at your photos. Oh man this looks good. Definitely a great cooking project for a cold day! Gina that looks incredible and love that the lolipop look of these shanks is labor free! Bonus! The green harrisa sounds so perfect with these! This looks seriously amazing! 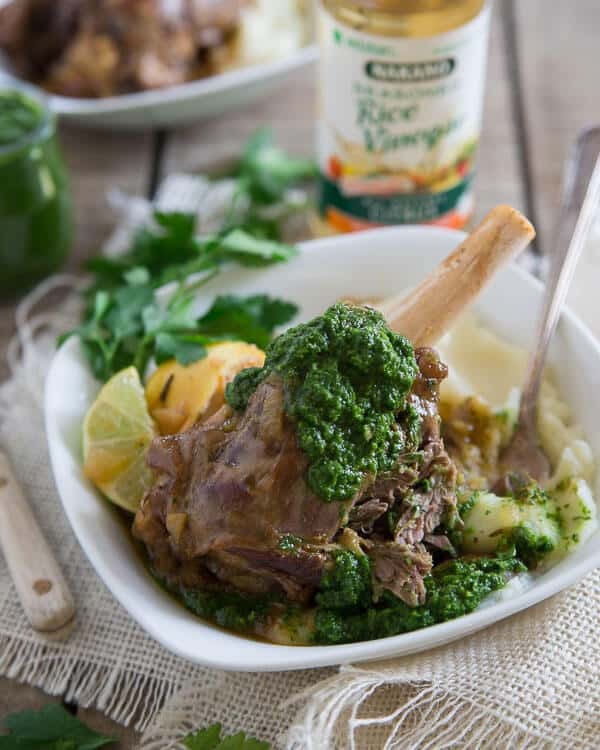 I never had green harissa but it sounds lovely with those lamb shanks. Gorgeous photos! It’s like a beautiful, fancy, delicious Flintstone dinner! This is one gorgeous hunk of meat. Cold weather demands meals like this. Pinned. Gina, I’m so glad to have come across your blog via the Facebook group- I’ve spent the better part of the last half hour just stalking all your older recipes and they look amazing! I LOVE lamb shanks and it’s a popular meat in Australia- pinning! Holy crap Gina, these look amazing.